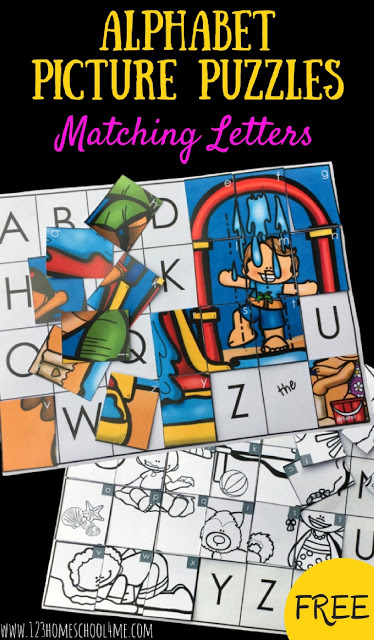 If your kids love puzzles and are learning the alphabet these free Alphabet Picture Puzzles are for you. They’re perfect for Pre-K and Kindergarten children as well as homeschoolers. And the summer themes will have them thinking about the warmer weather around the corner! These clever Alphabet Picture Puzzles are a fun way for kids to not only practice their alphabet letters, but also matching uppercase and lower case letters. Download these alphabet picture puzzles below. 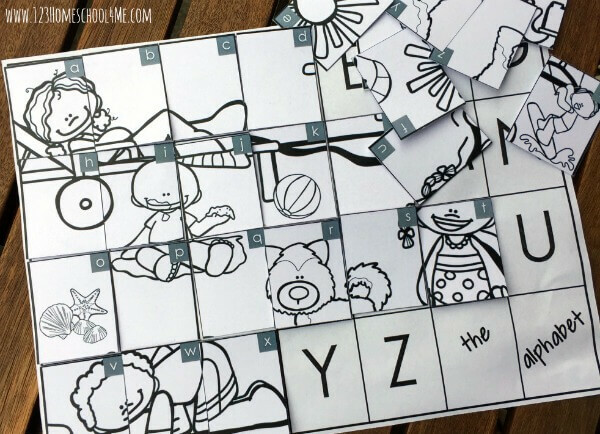 Print the color or black and white pictures onto card, plus the alphabet mat. If using the black and white versions, color them first! Cut the pictures into small pieces and keep each puzzle in a separate, small ziploc bag. Laminate the mat and small cards for longer use if you’d like. Children place the alphabet mat in front of them. Taking one puzzle, lay each piece in the correct place by matching the lowercase letters on the picture pieces to the uppercase letters on the mat. Looking to see if the picture is correct is a way for kids to self-check their work. To add more fine motor elements, use glue to attach the picture puzzle pieces to the alphabet mat. 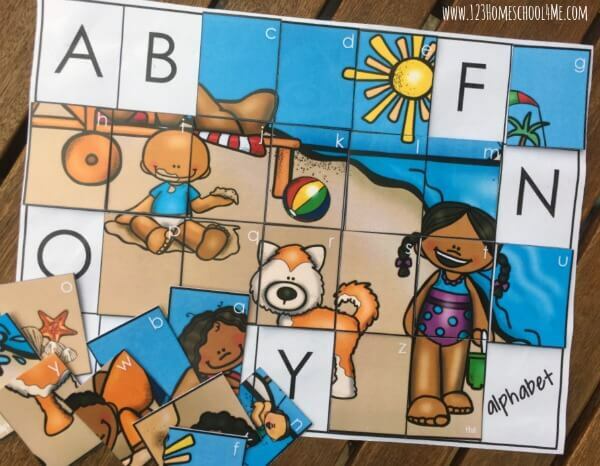 To make it easier for those starting out do half the puzzle and then ask the child to complete it, leaving out the letters they are more familiar with plus a partially completed picture which will help them finish off the puzzle.